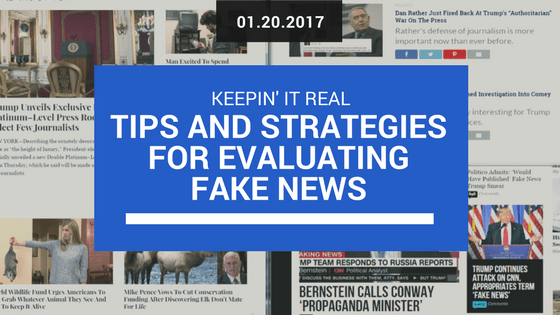 In an effort to provide students with an open space to learn about and discuss recent national concerns over “fake news,” we will offer four sessions of the workshop “Keepin’ It Real: Tips & Strategies for Evaluating Fake News” during LMU’s Inauguration Teach-In on Friday, January 20. During this session, students will have the opportunity to talk about how misleading news sources (encompassing misinformation, disinformation, click-bait, propaganda, etc.) have affected their views on civil discourse, specifically relating to the recent U.S. presidential election. By the end of the session, we hope students will be more confident in their ability to use critical thinking skills to judge the reliability of news reports, whether they come via print, television or the internet. Students are welcome to drop-in during any of the four sessions as space permits. We additionally encourage students to participate in as many of the Inauguration Teach-In events as their schedules permit.